About Alan Michaels Design – Now That's Style! We proudly provide our most sophisticated and discerning clients, a shopping ‘experience’, highlighted by ease, comfort, convenience, satisfaction and the pure joy of wearing an exquisite garment that was created especially for them. Our mantra is ‘Classic-Contemporary Custom Clothing’, and we provide this at the highest level, by focusing on six essential competencies including: Classic design, old-world tailoring, contemporary styling, attention to detail, impeccable fit and unwavering customer service. Now… Welcome to the world of Alan Michaels Design! Alan Michaels Design taps into the aesthetic of bespoke Saville Row tailoring. 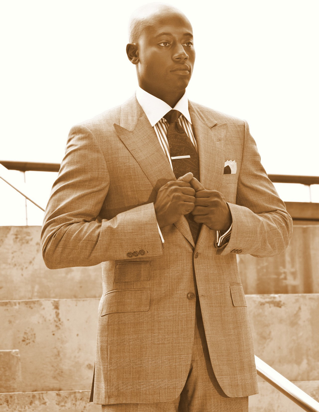 Our focus is high-end men’s suiting and shirting. In addition to offering a line of accessories including ‘made-to-order’ footwear, Alan Michaels Design also provides additional client services including wardrobe development, personal styling and personal shopping. We offer garments ranging from fuller more forgiving styles to modern ultra-slim cuts, filling each client’s specific needs from business-casual to formal wear. The beauty of custom tailoring is it allows us the ability to offer each client a garment that beautifully exemplifies his style, taste and lifestyle. Understanding the essential nature of a garment’s style and cut, we make sure never to forget the essence of proper ‘fit’, while taking into account both fashion and function. Classic design inspiration from a by-gone era.